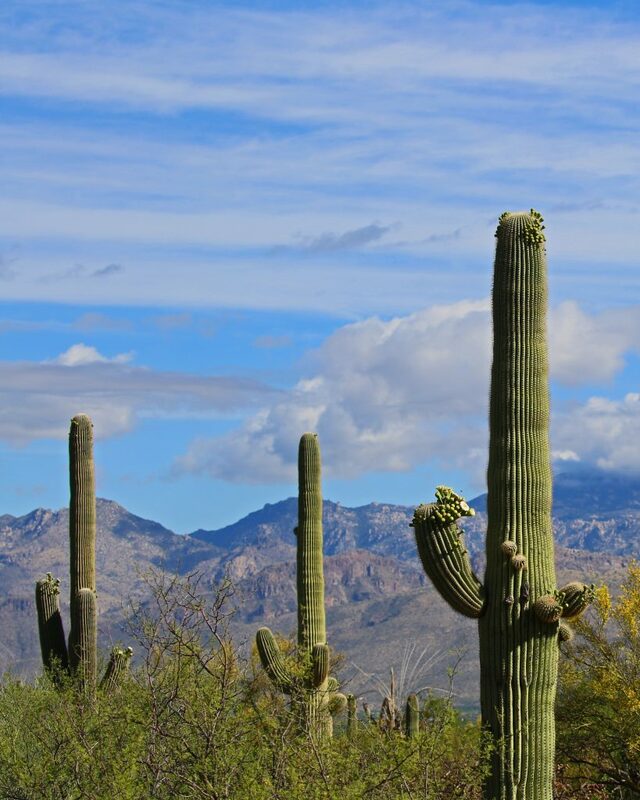 Are you planning a trip to Saguaro National Park in Arizona? 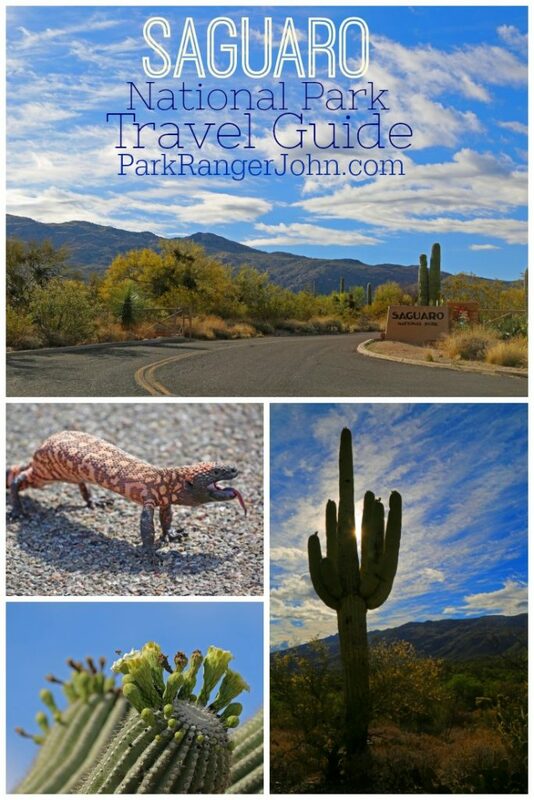 We are excited to share our Saguaro National Park Travel Guide filled with great info to help you plan your best vacation! These are things we have learned from visiting the park. My first tip is to not get food poisoning while visiting Saguaro National Park. Trust me on this it is not the best place to have this happen. You see there is only 1 bathroom along the scenic drive at the east portion of the park. 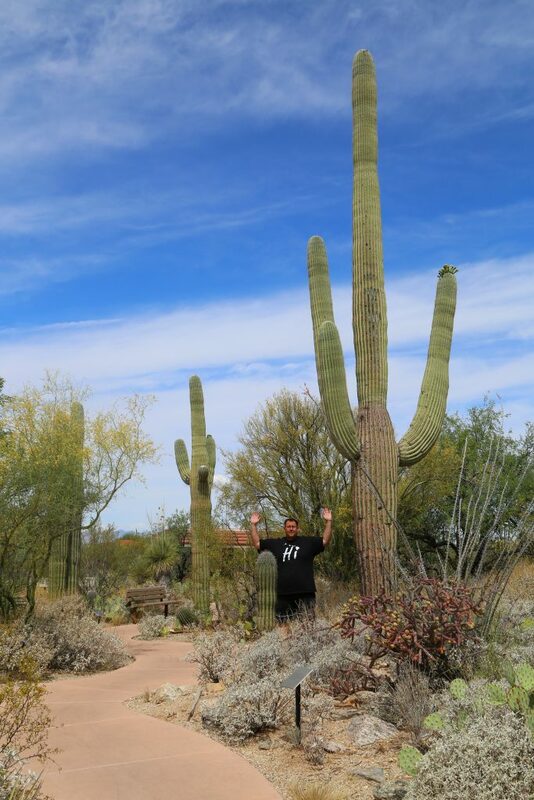 When both you and your wife end up with food poisoning, and there is only 1 bathroom and you are surrounded by saguaro cactuses…well you can imagine what fun that morning was. We had the opportunity to photograph them crossing the road and along the side of the road during our visit to the park. You can print the current park brochure before your visit here. This will give you up to date information on programs being offered and things to do in the park. Bring water with you or a water bottle. Most of the National Park stores no longer sell water. There are water filling stations at the visitor center and bike ramada in RMD. Pack sunglasses or a hat! It can be crazy bright and sunny in the park. Sunscreen is also your friend. Africanized honey bees also are known as Killer Bees are found in the park! Be aware of your surroundings and listen for hive activity. If you are attacked get the heck out of there as quickly as you can while protecting your face and head! The bees will stop attacking when you are 1/4 to 1/2 mile away from the hive. YES that far away! Don’t play with cactus! See our post on what happened while we were at Joshua Tree to see just how painful a Cholla Cactus barb can be. Drones cannot be flown within the National Park. How much does it cost to visit Saguaro National Park? Annual pass covering entrance and standard amenity fees for national parks and other federal fee areas. This replaces the National Parks Pass and Golden Eagle Pass. Lifetime admission and discount pass for US citizens or permanent residents who are age 62 or older. How do I get to Saguaro National Park? Travel west on Speedway Boulevard. At the junction of Camino de Oeste, Speedway Boulevard will change names to Gates Pass Road. From this junction, drive 4 miles (6.5 kilometers) west on Gates Pass Road until it ends at Kinney Road (turn right on Kinney Road). Drive 3 miles (5 kilometers) north on Kinney Road to the Park entrance (entrance will be on the right side of the road). Vehicles exceeding 12,000 pounds GVWR are prohibited on Gates Pass Rd. Where are the Saguaro National Park Visitor Centers? Visitor Center is open 364 days per year. Where can I find out about staying/camping in Saguaro National Park? Saguaro National Park has no campgrounds that are accessible by vehicle. 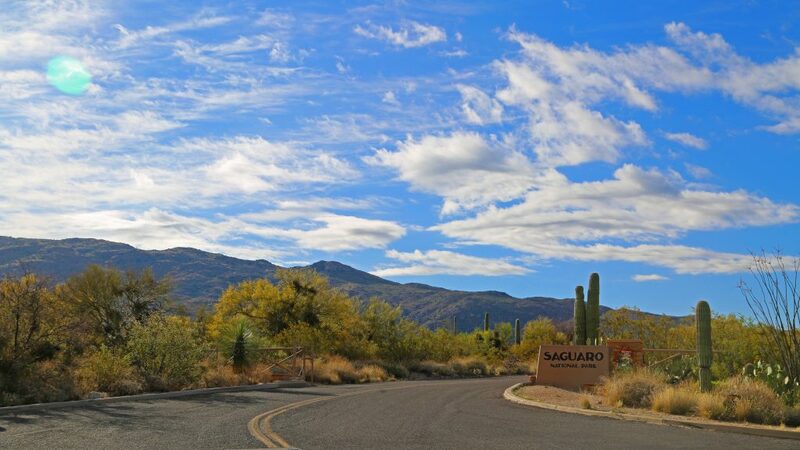 Backcountry camping is available in Saguaro East only. Primitive camping is available in the Saguaro Wilderness Area, located in the Rincon Mountain District, and requires a camping permit. There are many public campgrounds available nearby. The closest campground to the Rincon Mountain District is found on the Coronado National Forest. Call (520) 760-2301 for more information. Is there a Junior Ranger Program at Saguaro National Park? Yes! The park offers both a Junior Ranger program and a Not So Junior Ranger program! You can learn more about both programs and the Self-Guided Discovery Day Packs that are offered at the park here. Can I bring my Dog/Pet with me to Saguaro National Park? Pets are allowed only on roadways, picnic areas (except Mam-A-Gah picnic area in the Tucson Mountain District-west) and paved trails (Desert Ecology Trail & Desert Discovery Trail). Pets must be kept on a leash that does not exceed 6 feet at all times. Be prepared for cactus spines, thorny brush, rattlesnakes, scorpions, and open mine shafts within the park. Take extra water for your pet and do not leave them in your vehicle. 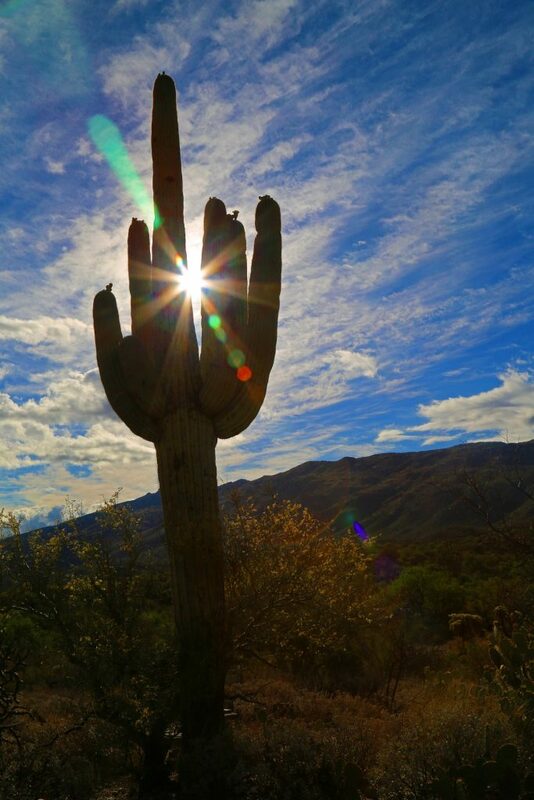 The highest recorded temperature at Saguaro National Park was 117 degrees F. in 1990. 6 known species of rattlesnakes can be found in the park. Holiday Gift Guide for outdoor enthusiasts! Oh MY GOSH! 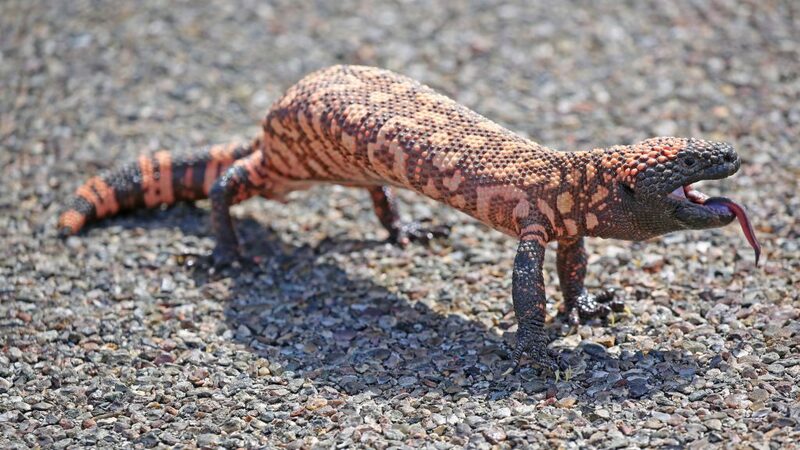 I’m so jealous about the Gila Monsters!!! 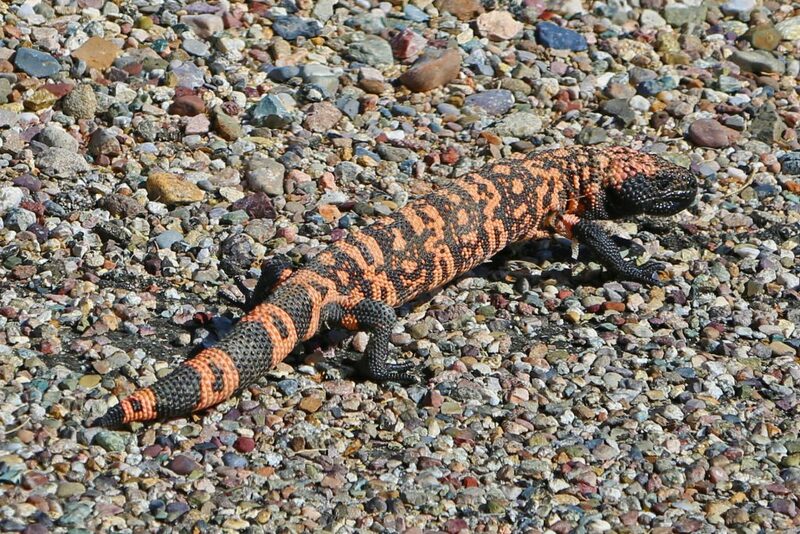 I’ve lived here in AZ for a huge chunk of my life and have never seen one in the wild (and have always wanted to). You guys got SO lucky! So cool! Sara, That is crazy! They were all over the place while we were there. I think it is time that we all plan a return trip to Saguaro. Though this time I am happy to skip the food poisoning..lol!